I’ve never seen anything else make my girl so happy. She finally lost her first tooth at dinner last night after enduring a drama-filled five days learning that losing teeth is actually painful at times. It was our home group night, so she enjoyed showing off her new found treasure to everyone. Repeatedly. And again. Did I tell you how happy she was? 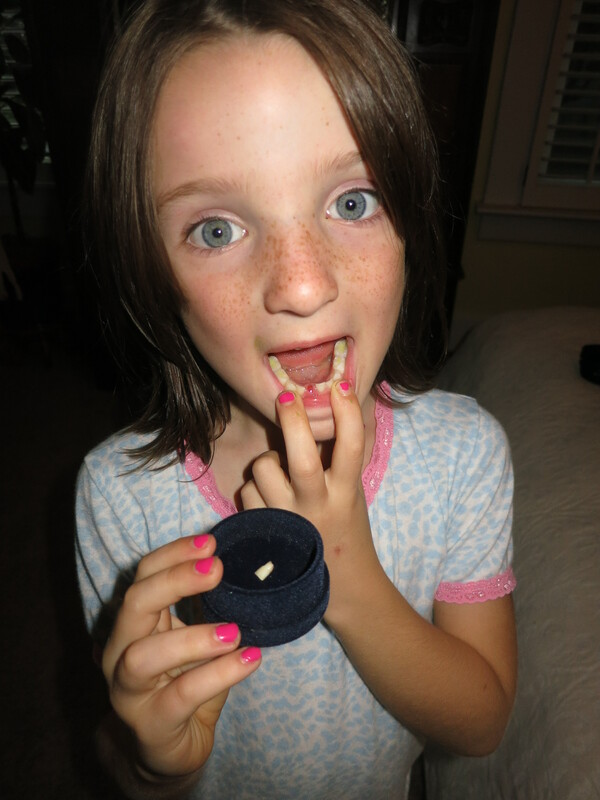 Our girl is growing up and now we get to figure out the whole tooth fairy thing. I feel somewhat guilty that I don’t have an original plan, doing something other than leaving a five dollar bill. I’d like to think of something different, like a picture of her parents after they lost their teeth, a bronzed toothbrush, or ivory fairy tears. Anybody have any good ideas? According to her count, we have 22 more chances. Wow, this means she’s officially in elementary school! So what I did with Hannah is type a note in pretty teeny font on the computer for Hannah from her tooth fairy, “Pristina” and printed it out. I sprinkled “fairy dust” on the note and left it along with a dollar with the first of many Fairy books in the color fairy collection, I think the first one was called “Ruby the Red Fairy”. Every time she lost a tooth she got a new book, dollar, and note. She loved it! Of course eventually she figured out that I was the tooth fairy, but I don’t think that was until she was about 9 or 10.